White sturgeon. Photo courtesy of Professor Peter B. Moyle. White sturgeon, mouth. 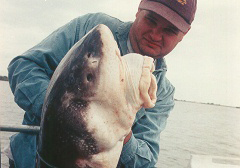 Caught in April 1997 in the Sacramento River (at river mile 14, the tip of Grand Island). Photo courtesy of John Hileman, California Department of Fish and Game. White sturgeon, in tank at UC Davis. Photo courtesy of Dennis Cocherell, UC Davis. Note: fish have orange flagging tape tied to their tails for identification purposes. White sturgeon, heads, in tank at UC Davis. Photo courtesy of Dennis Cocherell, UC Davis. White sturgeon are anadromous fish that spend most of their lives within an estuary, usually returning to freshwater only to spawn. 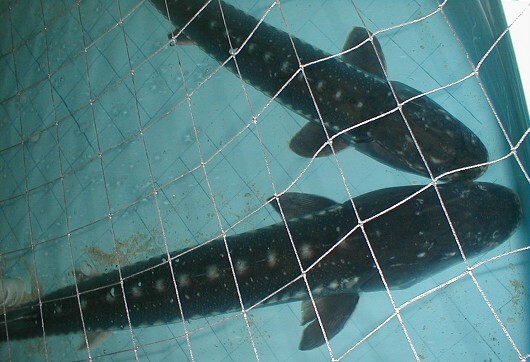 White sturgeon have been found in some cases to travel hundreds of kilometers to other estuaries and river systems. When sturgeon larvae hatch in a stream they begin swimming around in a vertical position as they are suspended by a yolk sac, making them more susceptible to be carried down to the estuary in the current. After they consume the sac they begin swimming freely and feeding through their mouth. In general the distribution of sturgeon in an estuary is age dependent and a function of salinity tolerance. The younger fish are found on the upstream or freshwater end of an estuary whereas the older fish are found on the ocean side. Once white sturgeon have adapted to the changes in salinity they may move around a bay or estuary to find an optimal type of brackish water. They grow quickly in their first year, up to 30 cm FL in the San Francisco Bay estuary, and the growth rate generally decreases with age. The diet of young sturgeon consists primarily of different types of crustaceans, though they begin to increase the diversity with age. Most food is taken from the bottom of the estuary where the sturgeon may pick up clams, crabs, and shrimp. Larger sturgeon begin to feed on other fish such as anchovies, starry flounder, smelt and striped bass. The opportunism of the white sturgeon can be seen in their documented consumption of crayfish, trout, frogs, salmon, crayfish and even one domestic cat. Male sturgeon reach sexual maturity before the females, though time of onset of maturity for both varies with photoperiod and temperature. Typically males are at least 10-12 years old and have a fork length of 75-105 cm. Females mature when they are 12-16 years old and have a fork length of 95-135 cm. White sturgeon don’t necessarily breed annually and only a small percentage of the adult population spawn in a given season. Males may spawn every 1-2 years and females every 2-4 years. The sturgeon begin migrating in streams during winter, with large peak flows triggering the spawning between February and early June. The optimal water temperature for spawning falls in the range of 8-19°C. Fish biologists believe the white sturgeon pick deep swiftwater areas to spawn such as riffles or pools with rock and gravel substrate. Female sturgeon produce many eggs, with the Sacramento white sturgeon producing an average of 5,648 eggs per kilogram of body weight. Male sturgeon fertilize the eggs, giving them a tacky property that allows the eggs to stick to the substrate till the larvae emerge 4-12 days later. 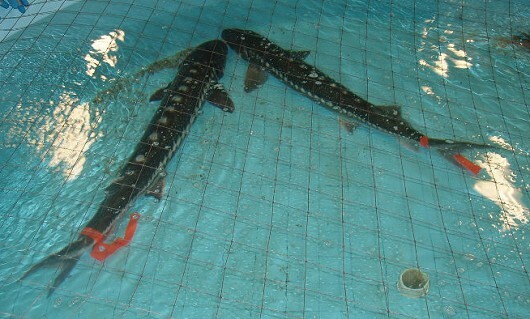 White sturgeons have a long life span that may have exceeded 100 years historically.